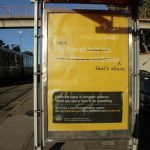 In 2015, the City of San Francisco’s Department on the Status of Women hired Circlepoint to create an awareness campaign for Domestic Violence Awareness month in October. Past campaigns had focused on reaching out to victims or targeting aggressors. 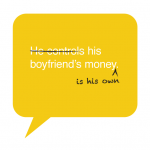 This was the first campaign for the city that addressed the many bystanders who see harmful relationships and empowered them to speak up. 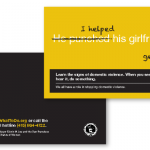 The goals of the campaign included engaging, informing and motivating bystanders from diverse backgrounds to take action if they witness, hear, or suspect domestic violence. We took a strategic approach to market research to ensure the new campaign not only reached but also connected with the potential bystanders of domestic violence from within San Francisco’s diverse communities. We conducted four focus groups: one in Chinese, one in Spanish, one with LGBTQ communities, and one with a representative cross-section of the general public. We also facilitated a round table discussion with domestic violence advocates to gather their input. The research guided our campaign by helping us determine which messages to use for specific audiences and how to visually present the campaign. Our media strategy used data from the Department’s Family Violence Council report to identify the neighborhoods that generate the most 911 calls for help in domestic violence cases. We placed a mix of Muni transit ads on lines serving these neighborhoods, with Chinese ads placed in Chinatown and the Sunset and Spanish ads placed in the Mission and Excelsior. 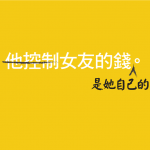 Our digital media buy included both video and static ads on Facebook, targeting San Franciscans who use the social network in English, Chinese, and Spanish with in-language ads. The campaign was also one of the city’s first to run in-app ads on on-line dating sites. By the end of its run, the campaign resulted in more than 10 million impressions within the San Francisco market.